TODD-AO, a wide-angle deep-screen motion picture process, is the new name in the industry and it brings new sight and new sound experiences to movie-goers. It has been designed and developed to be an industry-wide system. Pictures in this process are photographed in the usual way on either large (65/70mm) film or standard film (35mm) as preferred and projected in the usual way from a theatre's regular booth. The outstanding feature of the many that distinguish TODD-AO's new sight and new sound is the sense of participation - the feeling of emotional and physical participation that audiences feel because TODD-AO enables them to be part of what they see and hear. You react to emotional scenes as if the actors were actually there in the theatre and you are part of the action that takes place, reacting physically as if you were part of that action in fact. This reality is achieved by the unique design of the camera lenses, projector lenses and the deep curve of the screen; all designed to fit one with the other with the precision of a scientific instrument. By means of a special printing process the distortions caused by high angle projection onto deeply curved screens from the regular booths of theatres are magically eliminated. This has never been done before and it is what makes regular projection on a deep screen possible-and the deep-screen is necessary to create reality. TODD-AO is a system for every theatre, large or small. Do not fail when you go to see “Oklahoma!” in the Rivoli to walk to every corner and part of the theatre so that you may see for yourself that it is a system; for every seat, something that is not true of any other method of projecting moving pictures, including standard film projection. It has taken courage, initiative, and the wonderful American spirit of willingness-to-dare, to take a risk, to bring “Oklahoma!” in TODD-AO to the Rivoli. The story of this achievement is dramatic in its own right. First, Mike Todd went to Dr. Brian O'Brien, then at the University of Rochester, and asked him if he could create a wide-angle, deep-screen motion picture process using one camera and one projector. When Dr. O'Brien who shortly thereafter became Vice-President in charge of Research for American Optical Company, said "yes," Mike Todd went to Joe Schenck, and George Skouras, who joined with him to form Magna Theatre Corporation, the Company that raised the money to produce “Oklahoma!”, and together with American Optical Company financed the development of the system. The two Companies, in turn, formed The TODD-AO Corporation to license producers to make TODD-AO pictures and supply equipment for that purpose and also to sell TODD-AO theatre equipment to exhibitors. Dr. Brian O'Brien started work early in 1953 and has had upwards of one hundred scientists and engineers working with him in the development of the various phases of the system. Dr. Hopkins of the Institute of Optics at the University of Rochester, in particular, worked with him on the famous 128° "Bug-Eye" lens. The Institute was preeminent in the field of wide-angle lenses, having developed the Gunnery training wideangle lens used by the U.S. Navy. From the outset, George Skouras insisted that the concept of this new motion picture system be broadened to make it industry wide - a system for any theatre and for every seat in any theatre with the worst seat as good as the best. The concept has been achieved almost 100%! To accomplish this, Dr. O'Brien developed the special printing process that eliminates distortions and makes possible projection from any theatre's regular booth. Not long after the development work started, Arthur Hornblow, Jr., joined Magna and through his efforts Richard Rodgers and Oscar Hammerstein became interested in making “Oklahoma!” in TODD-AO. The first tests of this new system made by Mike Todd and Skippy Sanford, our photographic Director, were shown at the Regent Theatre in Buffalo in June 1953 and successfully proved that the system gives audiences a sense of physical participation. Further tests were then undertaken under the direction of Fred Zinnemann, the Oscar winning director, to find out whether or not a story could be successfully told in this new system. The tests were shown in Buffalo on August 14, 1953. In the words of Fred Zinnemann, they demonstrated that for the first time in the history of moving pictures, audiences have the same feeling in viewing a moving picture that they have in seeing a play in a legitimate theatre. The proof of the success of these tests came when Rodgers and Hammerstein signed to produce “Oklahoma!” in TODD-AO. To increase the sense of reality, an entirely new sound system was developed under the leadership of Fred Hynes, our sound director, in cooperation with Westrex and Ampex. It is a six channel system based on the principle of Sound-Saturation of which Sam Goldwyn said after hearing some “Oklahoma!” songs for the first time "This is better than music", a remark far more accurate than amusing because TODD-AO Sound is more true when reaching the ear than any sound theretofore heard whether in a theatre or a building especially built for music. 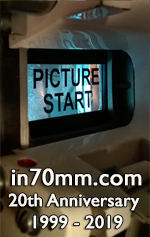 To bring this new System to the moving picture theatres, American Optical Company has developed for TODD-AO projection lenses and, with Philips of Holland, a universal projector that projects 35mm and 70mm film in all the standard versions and can handle any of the sound systems that are in use. It is important to note that TODD-AO is compatible with any sound system so that any theatre putting in TODD-AO equipment can use its present sound installation. Screens, frames and accessory equipment are all available for immediate delivery. Our theatre equipment division is headed by L. Douglas Netter, Jr., known to the leading exhibitors from coast-to-coast. We in TODD-AO are prepared to serve the industry with an industry system. "The proof of the pudding lies in the eating". The proof of this new industry" wide system, TODD-AO, lies in seeing and hearing it at the Rivoli Theatre in New York where “Oklahoma!” opened on October 10th to be followed by subsequent openings in Los Angeles, Chicago, Detroit, St. Louis this year and forty or more cities in 1956. Already Michael Todd's "Around The World in Eighty Days" is in production and "South Pacific" is planned for production next spring. With TODD-AO, we are on the threshold of a new age in entertainment!